The Print Society, a design studio that produces a range of homewares and objects, is committed to providing your home with a creative vibe. 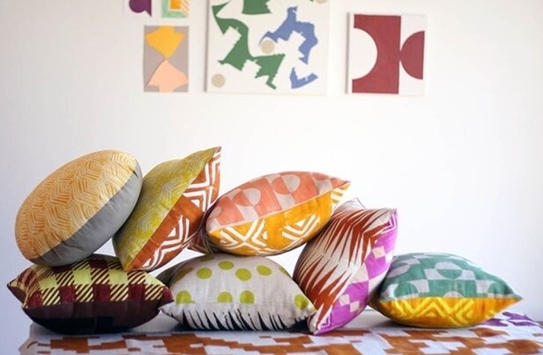 Founded in 2012, The Print Society features bold, modernistic and geometric hand printed designs, with a focus mainly on pattern, colour and texture. Worth applauding is the way The Print Society merges modern methods with India’s age-old craft traditions to create pieces with an adventurous spirit. Enjoy a voyage of vibrant colour, craftsmanship and detailed embellishments in delicate shades of blood orange, violet, lilac, coral, shimmery pinks, toffee and ocean blue that effortlessly contrast against wheat tones. Each of the designs are hand-block printed in Karen’s Sydney studio and brilliantly blurs the boundaries between art and design. Each design breaks free from homogeny to create a spontaneous and adventurous masterpiece that embraces indulgent detail. Flip it! with its reversable pattern. Each cushion helps to create a signature statement with expressive patterns designed to empower rather than overwhelm the space. The Print Society is a brand with integrity, rich in exotic- influence that capture a colourful essence. The colourful interplay of toffee and fuchsia balances out with handsome wheat tones. Check into checkers this season with The Print Society’s Venetian Red on Lemon design which has been printed on 100% silk. Each of the designs are truly delicious with a Black Steps print on chocolate-coloured 100% linen. Sage Shapes Hand Printed Cushion theatrically contrasts against Ochre Mountains, printed on hand dyed 100% matt silk on the reverse. Embrace your instincts. The Black Tracks is the latest animal pattern to leap from the runway. Inspired by dusty animal tracks in the desert, this pattern with funky lime green polka dots on the reverse, has an abstract appeal with a naturally uneven and asymmetrical quality that makes each piece feel one of a kind. The Print Society’s current range invites you to step into the desert. A barren land where earthy terracotta tones celebrate the outback’s dusty terrains. All designs are available with or without a 100% PET cushion.